Lying roughly in between Frome, Shepton Mallet, Bruton and Radstock is this little architectural gem. Well, at 148 feet tall and 919 feet above sea level, it’s not so little, really. It just seems so, in the way it nestles hidden among the tall, hill-top trees of East Somerset. It cannot be seen from the road and one would have to spot it on a map to know how to reach it. It is a folly dating from that Victorian era, when the building of such things was a social necessity for those with enough money to do so. It was built between 1862 and 1864 by Thomas Henry Wyatt for John Moore Paget, of nearby Cranmore Hall. In spite of it not being so old, it has a feel of some medieval towers – no doubt it was intended to. 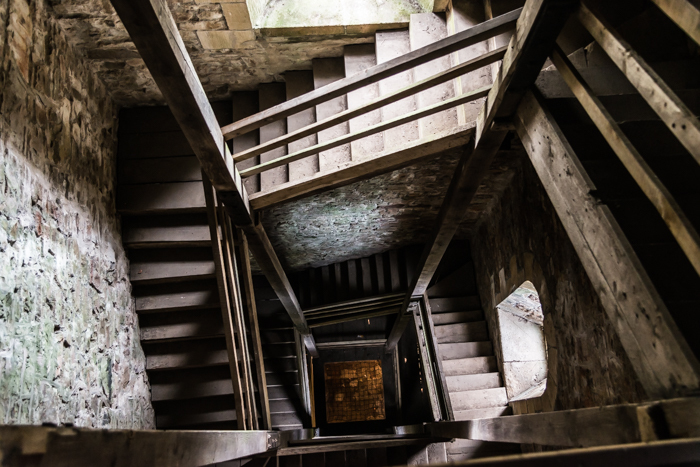 I was reminded of climbing the Belfry Tower in Bruges some years ago, as I ascended, struggling for breath, the 184 steps of the Cranmore one. Since its life as a folly, the tower has had other uses: during WWII, it was a lookout post for the Home Guard, and now, after major restoration works, it has become a tourist attraction. It seems to me that, in spite of the lack of light, the best photo opportunities lay inside the tower, following the vertiginous twists and turns of the timber staircase, rather than outside, where the flat light of the day did little to bring charm to what is in fairness a fairly plain stone column. As I didn't have a tripod with me, the super-high ISOs available on today's cameras came in handy. The photograph posted here catches the view down through the stairwell. The result puts me in mind of Piranese’s etchings. The structure has a rather more benign meaning than his fearsome, imaginary prisons, but the medieval feel of the place (or this image of it), created by the exposed stone, rough-hewn timber-work, sparse light and the camera’s way of ‘seeing’, still carries that sensation – to my imagination, at least. From the top, the tower afforded great views across Somerset and beyond. It is alleged that you can see as far as Dorset, Wiltshire, Devon and Gloucestershire. The man operating the place told us you could see even the suspension bridges that link England to Wales across the River Severn. I’m afraid I couldn’t discern them. Maybe a telescope is required.